Three days later I posted the first strip as part of a five day experiment to see if could do a daily comic strip. I didn’t really have any sort of plan or story in mind. I invented and designed characters on the fly, within the strips themselves. No color, just black and white. They weren’t even drawn very well. I was just trying to get stuff done as quickly as possible. I had so much fun doing it I extended the experiment to a second week. I quickly realized that a pretty crazy story was starting to emerge from my collection of Superman, Robin, Dr. Sivana and Black Widow analogues. The Flash, Etrigan the Demon, Wonder Woman, Wolverine, Captain America and Maxima analogues (+10 to whomever can correctly pair up the famous [and not-so-famous] comic characters with their SuperFogeys counterparts) came a little later, along with a whole host of other characters. A motley crew if there ever was one. Presented below, for the first time in a looooong time, is that original set of five black & white strips as they originally appeared to readers of my blog on MySpace seven years ago. You’ll notice a few differences from what you’ll find on the site today, the biggest of which are the different outfit for Captain Spectacular (changed because it too closely resembled Superman’s–especially when colored) and the omission of what is now strip #3 (it was created later after I decided to go back and color the strips and continue the story). Big thanks to all of who have stuck with us over the years, and big thanks to those of you who discovered us a little later. You make it all worth doing. Extra, extra special thanks to Marc Lapierre, without whom The SuperFogeys would have ended years ago. I’m so glad we’re still going strong. It’s been a pleasure following you on this adventure for so long, Brock. So glad you’re still with us, Mike. We go way back, don’t we? Wow, has it really been seven years? I remember when you posted some of the earliest strips in your ms blog! It sure has come a long way since then. 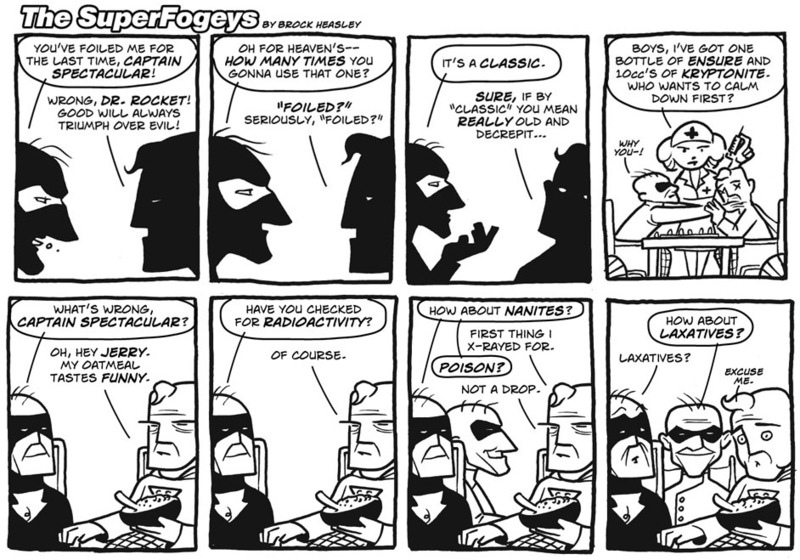 May the superfogeys continue to entertain us for many years to come! Ed! Yes indeed. 7 years. Hardly seems possible, doesn’t it? I had a rather hard time cohsoing just one type of physician I would want to work for. So many of them fascinate me, and with me not really going into any medical field other than support, I never gave this any thought in the past. After reading the list, I am more favorable of working for a neonatologist. It is difficult to think about how neonatologist physicians sometimes have the most difficult job in the world, but I can only imagine how amazing it would be to be a part of saving a baby’s life. I had a coworker once whose baby was born at 36 weeks, and her baby had a lot of heart and lung problems. There were concerns about whether or not they would ever fully develop once she had him, but after many months in the NICU, and many scares that happened during it, the doctors were able to save him and he is now a very healthy 5 year old. It is because of that I have a higher interest in the neonatologist field.I hate to say which type of physician I would care less to work for, and it is because I worry that many will take it the wrong way. When I was 16, I used to help my mom at an assisted living home as a caregiver. We would get to work at 7:00 A.M. every morning to prepare breakfast for four of the elderly men and women that we were caring for. We would then make sure that all bedding was changed, rooms were cleaned, meals were prepared, and appointments were handled. We worked 12 hour days, and they were always grueling. The owner of the home made sure that everyone had their medicine and made it to their doctor appointments on time. However, she was more worried about getting paid for her services than actually helping the elderly. She would yell at them if they did something wrong, and even call them terrible names. My mom reported her and we both quit our job, but it has always left a sting in my heart since then. It is because of my experience with that situation that I do not think I could ever work for a gerontologist. I know that the situations would be much different, but ever since my experience with caring for elderly individuals it is very hard for me to think about assisting a physician in geriatrics because I worry that someone else might treat the elderly in the same way the owner of the home did. I am a firm believer that the elderly deserve the ultimate care and comfort when going through any treatment and aging in general, but I do not think I could ever work in that environment again. The smile of a yandere is also a frightening sight to behold. I should know; I dated one. About lost an eye once. It has been a while. I was surprised to learn that you are also fake internet friends with my sister, Wendy Givens. I don’t know how that happened. Anyhow, your blog wouldn’t let me comment on it. I wanted to say that what I loved about Breaking Bad (I watched a few seasons) was how it gets you to cheer for Walter White and then forces you to wonder why you still cheer for him. The whole idea of antagonist protagonist is turned upside down and all around. I loved that. But I felt kind of guilty for loving it too.